What It Means to Be a Displays2go “Insider"
We value the feedback of you, our customers - you help make us who we are, and you’re the reason we’re able to continue growing as a company. We welcome you to be a part of this journey as "Insiders", providing feedback, ideas and inspiration along the way. But what is an Insider? Think of it like a brand ambassador, someone who can help shape the future of our company. You may also be asking “what incentives are there for becoming an ‘Insider’?" We need your feedback to continue evolving, elevating our business to meet your needs and the needs of customers like you. Let us know where we’re excelling, and ways we can improve - from the overall customer experience, all the way down to the details. We look forward to continuing to grow together, with more ways we can partner with you in the future! Interested in becoming a Displays2go Insider? Want to get in on exclusive promotions, win prizes or hear about our newest products before they even hit the shelves? Have you been itching to give us feedback about a display or business product that could help you sell more of YOUR merchandise? 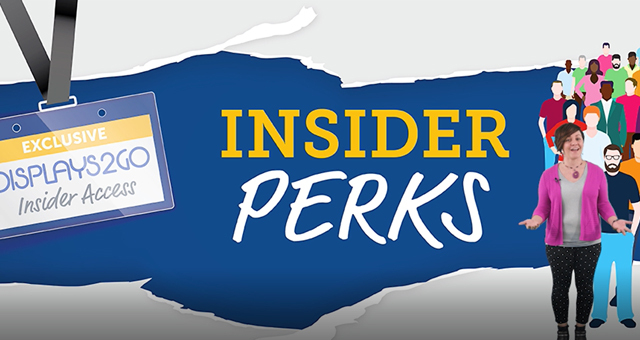 Sign up here to get in on all the perks you'll have access to as a Displays2go Insider.